A lot has change these past 4 months; With Makise's absence, I'll be temporarily replacing her role and duties. I've cleaned up the spam at the General Discussion area, and looks like the poster disappeared. Hopefully no one would do it again. I'm thankful for the Bishounen Gemu staff, especially our translators who kept things going while I was gone. We will be focusing more on Starry Sky in Autumn. Most of our translators disappeared so suddenly, but Laramie and Verdelish continues their duties. I am so grateful for them! We still need Japanese to English translators for Black Wolves Saga, anyone here interested? Fixed css for profile tabs and post icons. Good to see you guys alive! 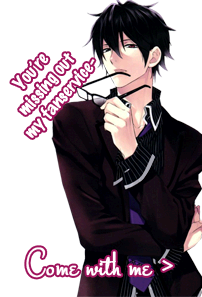 ...my blog where I translate Amnesia, Hiiro no Kakera & Wand of Fortune! Blue_Sargent wrote: Good to see you guys alive! I don't think it's likely that they will pick it up.. I can't find the article that I wanted to link.. but even though he's (Ben Bateman) mentioned BWS more than once as an example of the type of game he'd like to bring over.. he already mentioned that Sweet Fuse would be the last PSP game they'd bring over (although I'm not sure if he meant the last PSP game for Aksys overall or the last PSP game that is an otome game).. and I think he also mentioned that they wouldn't bring over a PC game.. (I'm sorry I can't find and link the article).. But from now on I think we can only expect 3DS or PSVita games..